When I visited Cars Land at Disney's California Adventure this year (back in April, see my post HERE), I thought it would be fun to get some of the little exclusive "trinkets"/"knick knacks" for my collection to remember our great times there by. The style of many of the items there in Cars Land at the giftshops are a more "touristy" style, stuff like little snowglobes, mugs, postcards, antenna toppers, keychains, etc., to make you feel like you are visiting the real Route 66/Radiator Springs on a roadtrip (at least that's kind of how I see it, so I embraced that). Little gift shops and gas stations in small towns across the country always have those types of things. 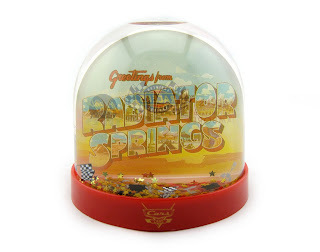 One of the souvenirs I picked up is this cute little plastic California Adventure "Greetings from Radiator Springs" snowglobe. 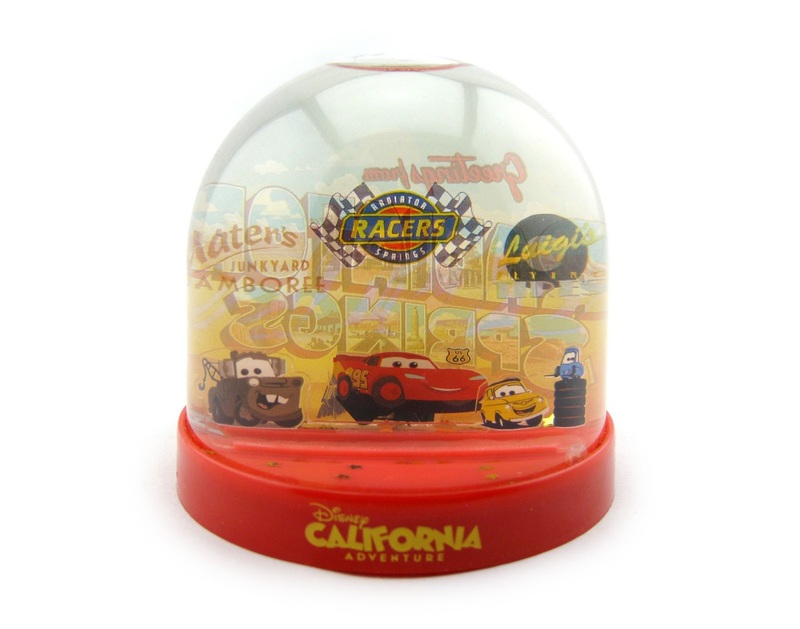 It features Lightning Mcqueen, Mater, Luigi and Guido and the names of the three main attractions there at Cars Land: Mater's Junkyard Jamboree, Radiator Springs Racers and (the now extinct) Luigi's Flying Tires. It looks great from the front or the back, so I guess it just depends on your preference when putting it on display. When shaken, little gold stars, checkered flags and piston cup trophies float around the water as they fall down back to the surface of the globe. It's nothing fancy, but like I said, it's a fun memento that a collector like myself can appreciate. Looking at it definitely brings back all the great memories my wife and I had at Cars Land over the past couple years! If you are wanting to add this to your Disney·Pixar Cars collection you can find it in several of the gift shops there at at Cars Land; it's not hard to find there currently. However, I haven't found it available to purchase online anywhere. As far as the price, I believe it was somewhere in the $7- $10 range. Thanks for dropping by and be sure to leave a comment or shoot me an email if you have any questions!